With their inclusion, The Citadel Memorial Europe website contains records for all the 50 Citadel Men interred or memorialized in 15 American Cemeteries in Europe and North Africa and the one Citadel Man memorialized at a British Commonwealth Cemetery. During World War I, 316 Citadel graduates and an undetermined number of alumni served in Europe. The entire Citadel Class’s of 1917 and 1918 eventually served in the armed forces. Nine Citadel Alumni are known to have sacrificed their lives to hostile or accidental friendly fire on the battlefield. A brief history of The Citadel during WWI is available here. Born on Christmas Day 1892, 1Lt. 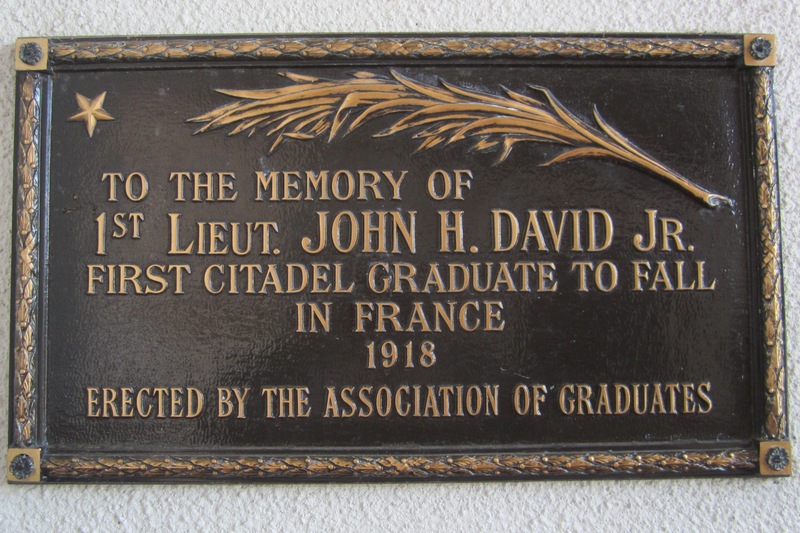 David, a native of Dillon, S.C., was the first South Carolina officer, and the first Citadel graduate, to be killed in action with the American forces in France on March 1, 1918. He was 25 years old and in the 18th Infantry Regiment, 1st Infantry Division. He rests in peace in St. Mihiel American Cemetery located 29 miles south of Verdun, France. The WWI cemetery has 4,153 graves of which 117 are “Unknowns”. Another 284 Americans are memorialized on Tablets of the Missing. A cenotaph was placed by 1Lt. David’s family in the Riverside Cemetery in Dillon, S.C. He is also memorialized on The Citadel’s campus where a bronze plaque bearing his name hangs in the sallyport of Padgett-Thomas barracks. LT Nicholls was a native of Spartanburg, South Carolina. He started at The Citadel as a member of the Class of 1912 but left to attend the US Naval Academy in Annapolis, Maryland. After four years there he graduated with its Class of 1914. During a visit to London, England during the summer of 1914 he decided to join the British Army as an artillery officer. He was killed in action on September 26, 1915, on the second day of the Battle of Loos, France. His remains were never found or identified, and he now rests in a grave known but to God. His name is listed, along with those of the more than 20,000 who suffered a similar fate, on the Loos Memorial at Dud Corner Cemetery in Loos-en-Gohelle which is maintained by the Commonwealth War Graves Commission. Like 1Lt. David, he is also memorialized on The Citadel’s campus. His family donated Panel 13 of the façade window in Summerall Chapel. In the panel is the young David rescuing the lamb from the wild beast. 1Lt. Mulloy was born January 8, 1889, in Cheraw, S.C. where he returned to work as a pharmacist after his graduation from The Citadel and the department of pharmacy at the Charleston Medical College. He served in “I” Company of the South Carolina National Guard which became a unit of the 118th Infantry Regiment, 30th Infantry Division in World War I. On October 8, 1918, he was killed in action during the Battle of Brancourt, France and now rests in peace at the Somme American Cemetery, at Bony, France. There are 1,844 graves in the cemetery and its tablets of the missing contain 333 names. 1Lt. Mulloy also has a cenotaph in the Old Saint David’s Episcopal Church Cemetery in Cheraw, and his name is inscribed on Cheraw’s WWI Monument located at the intersection of Market and Seaboard Streets. The Citadel Memorial Europe has researched these men as thoroughly as possible with limited resources. I am very grateful for the support I have received from the many people who, like I, believe these men’s stories must be recorded and shared, but there is still much missing information. Their individual in memoriam page contains what I have been able to gather and authenticate thus far. If you, or someone you know, has access to additional information about any of these men – stories, photos, family members, etc. – please contact me so that it can recorded and shared with the greater Citadel family and especially with those who visit and care for our Citadel Men’s graves and memorials. Together, we will continue to remember them. Click here to go to the alphabetical list of in memoriam pages for all 51 Citadel Men interred or memorialized in WWI and WWII cemeteries in Europe and North Africa. 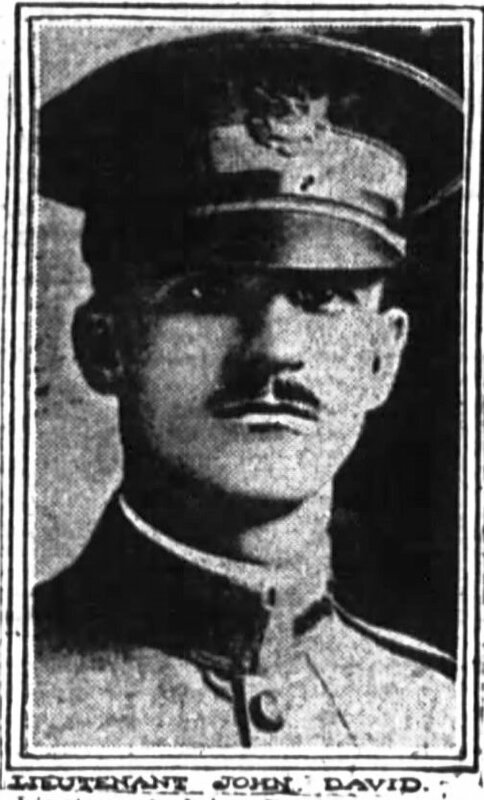 Photo from the Poughkeepsie Journal, 30 April 1918, page 10. Steve Smith, ’84 for his ongoing research to accurately account for and record all The Citadel’s war dead. Julious Burr, “Sheep Lady and Sug”, Robin Pellicci Moore, and all the other contributors to the Findagrave.com memorials of these men. This entry was posted on October 27, 2012 by Roger Long. It was filed under France, Loos, Somme, St. Mihiel and was tagged with ABMC, Citadel Men, Commonwealth War Graves Commission, France, History, Loos Memorial, Somme American Cemetery, St. Mihiel American Cemetery, The Citadel, WWI. Well done: Now the WWI-Citadel soldiers who fell in France have their own place on the website. Have you got pictures of all three, or only that of Lt. David? I have included everything I could find. I searched high and low on the web including findagrave.com and ancestry.com, but I was not able to find pictures of Lieutenants Nicholls and Mulloy. I think that at this point real research is required – meaning physically digging into the archives in South Carolina. Of course so much is being digitalized everyday maybe tomorrow something is available on-line. On a very positive note, yesterday, I did receive some additional information about Lt. David from a 1992 alumnus, which I have now included it in his record. Hopefully there will be more reactions and contributions which will lead to being able to put faces to their names.